Animated series. After Hiccup is shot down on a remote island while searching for Viggo and the Dragon Hunters, he questions Dagur's intentions to rescue him. Browse content similar to Enemy of My Enemy. Check below for episodes and series from the same categories and more! Come on, bud. Work with me here, please? So, what brings you here so early in the morning? with Stormfly? Yeah, well, same here! You're going for a recon flight. Alone! With no support! No cover! -I-I know, I just didn't want to wake anybody. -It's...no big deal - really. -Yes, it is. It's way too risky. I was going to say episode. into the ground looking for this guy who doesn't want to be found. -They won't tell you a thing. Look, if you're going, at least let me and Stormfly go with you. OK, bud. It's now or never. But with all that armour on, would we be able to do this?! Man, that new tail is awesome! Hey, bud? Let's get in closer. Looks like a dragon might have got the best of them. TOOTHLESS GRUMBLES Yeah, let's get out of here. THE MEN GROAN What the...! Sky, Toothless! I got you, Toothless. I'm right here. I know, Dragon Root. We've just got to wait it out, bud. And who knows how long that's going to take. TOOTHLESS WHINES Oh, come on. Oh, I am so sorry, bud. I am so sorry I got us into this! -What's that by the big tree? Oh, why didn't I listen? Why didn't I... What is wrong with me?! TOOTHLESS GROWLS Shh! Toothless, please...! OK, you stay still and keep quiet. I'm going to buy us some time. THEY MUTTER IN DISTANCE Ah! -Right here. Keep your eyes peeled. -You two, go that way. We think they got away, sir. They didn't get away! I saw the dragon go down myself! Gather more men and double back. And check the caves! we're not leaving until we find the rider and that Night Fury! Hey! How you doing? Think you can stand up, bud? Come on, let's try to get you up. Come on. No, no, it's OK! I got you, Toothless, it's OK, bud. went down somewhere around here! No, no, no, no! Toothless! You've got to be quiet! they're going to have to go through me! -I wouldn't do that if I were you. I'm not here to hurt you! I'm here to help! Seriously, you need to calm down. -Plenty of time to answer all your Hiccupy questions later! Right now, we need to move your dragon before these guys wake up. Or you can handle them yourself. Hmm? OK, keep it moving. Attaboy! Hiccup! Don't need the, uh, encouragement. -have done it by now? -I don't know, you're pretty crafty. Hmm, crafty! Well... Thank you, Hiccup. BLADE WHIPS THROUGH THE AIR Whoa! Dragons are a little heavier than they look. Come on, Hiccup. That's it. Help me out here. Oh, I knew it! What was I thinking? -Hiccup, this isn't a trap. Look, there. Hiccup! Just look! Please? I'll stay right here. -You got to help me, Toothless! -Sorry about that. My fault. I should've warned you earlier. I'll try to do better. And I have officially stepped into an alternate archipelago. OK, right over here. Good job, Hiccup. Yeah, I tend to have a lot of time on my hands these days. Here you go, little buddy, there you go. It's important to keep the mind sharp. Yes! Answers! I did tell you those were en route. oh, I would have loved to have seen the look on his face, as I drove a-! Have you ever tried that? It's cathartic. -I used to think that the only deep breaths were the last ones. -Yeah, you know, Heather. She's...OK.
Good, good. And her dragon? learning experience, I drifted at sea for quite some time. I've been alone on this island for months. body, and soul, Hiccup. I mean, you should try it sometime! I mean, I knew you were crazy, but this takes the cake. But I do understand your scepticism. Dagger, why in the name of Thor should I believe a word you say? You shouldn't. I don't deserve the benefit of the doubt. Oh, you take the little one. Yes, you good boy. -He's never been hit with one of these. I don't know, maybe, maybe Night Furies react differently? I never liked those Dragon Root arrows. Seemed like cheating to me. There is an antidote for this, you know? I saw Ryker and his men make it. to save your glorious Night Fury. Unless you want to take the chance of him surviving this on his own? You may need that. They're still out there. Bitterweed, that's the first ingredient. -Looks just like this, but darker. So, what caused this new Dagger? I told you - near-death experience and a lot of time to think. -Well, when you only care about yourself, life is simple. -Your actions are clear, consequences, who cares? Which makes her even closer than you and me. -A little something I picked up along the way. underneath the big elm tree. -..touch it with your bare hands. -Argh! Thanks for the early warning. I've got to work on that. Give it here, give it. Come on. Can't take you anywhere. Keep it in the water. Hey, next ingredient, fresh water. -So, you want to tell me why you're out here on your own? who changed after Viggo Grimborn. That stuff can kill you from the inside, Hiccup. Revenge, anger, obsession. Trust me, I know. It can make you do things you never thought you were capable of. it'll eat away at you slowly. -Yes! I'm sure! Purple oleander. -Do you always nag like this? Kidding. Sense of humour? No? Sense of humour, hmm? Blue oleander can kill a dragon. How is purple any different? -Please don't say it's purple. I was going to say nature. It's always a great mystery, Hiccup. I must be out of my mind to go along with any of this. I told you, I've changed. Woo! Those were some crazy dreams! -I was just about to give it to him. and hope they don't find us before then. But that could take quite a while. It's up to you, Hiccup. But I would suggest you lose the paranoia. It's a terrible existence. Here you go, bud. It's OK. HE ROARS Toothless? You OK? -You stay away from him! -Hiccup! I didn't know! You have to believe me! 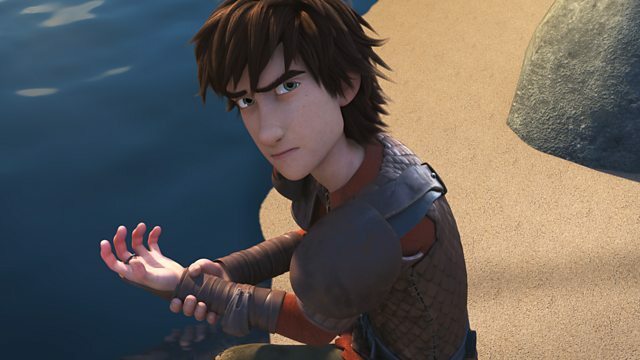 HICCUP GASPS I'm going to kill you! We're going to find that dragon. It's only a matter of time. -Why don't you make it easier - on everyone? Maybe this will burn a hole in your memory? Now you'll be part of the Dragon hunters forever. OK, enough! Enough! I'll take you to the Night Fury. Take a few more men with you, just in case. Come on, come on, come on, hurry, hurry, hurry! Sorry, brother. You'll just slow me down. You're a fake, Dagger! A fake! I hate you! You hear me?! This one will take us to the Night Fury. We'll come back for Dagger later. Put an end to his miserable life. Last chance, you want to help that Dragon? Help yourself? Then die you shall. Viggo will see to that. Take him. Ha-ha! It's good to see you, too! I have no idea how you stomach that. Oh, Toothless! It's good to have you back! Now, what do you say we show him how it's done? Toothless, barrel roll! Multiple blasts! They're so much tougher when they have you chained up, huh, bud? Yeah, we owe him one. Besides, maybe he'll get to Viggo before we do. Hiccup! Tell Heather I'm coming for her!